Giant dairy co-operative Fonterra has retained its forecast $6 per kilogramme of milk solids price for farmers, but trimmed the potential earnings per share by 5c, and is foreasting an unchanged dividend of 40c. 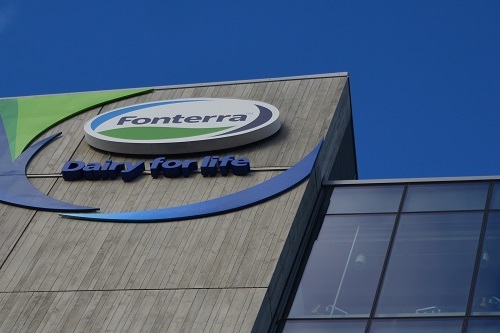 Fonterra Shareholders’ Council chairman, Duncan Coull, said the interim results announcement was "an encouraging one which was in line with the expectations of the Council and Fonterra Farmers". Coull said Fonterra's decision to pay out an interim dividend of 20 cents per share, while maintaining the forecast Milk Price at $6 per kg/MS, would "raise farmers’ confidence and enable them to alleviate cash-flow pressures which have built up over the past few seasons". Fonterra is forecasting a cash payout after retentions of $6.40. The co-operative's presentation for the interim results is here, while the interim report can be viewed here. In releasing the interim results today Fonterra made scant mention of the fact the earnings per share range was actually being reduced, just giving the new forecast of 45c-55c range and not mentioning the previous range of 55c-60c, which had been reaffirmed as recently as Febuary 23. Chairman John Wilson said Fonterra saw "some challenges and opportunities" ahead in the second half of the year. “The Board considered these factors and, while continuing to have confidence in achieving a target dividend of 40 cents per share, has revised the forecast earnings per share range to 45-55 cents to reflect the additional volatility." “The poor spring in New Zealand saw us forecasting milk collection to be down 7% for the season, but following good rainfall in autumn on-farm conditions are improving which means we are now expecting New Zealand collections for the season to be down by 3 % on last season,” Mr Wilson said. Earlier this month, IFA National Dairy Chairman Sean O’Leary said the GDT only traded 636,000t of product during 2016 - down 36pc on the peak levels of trade of 2014, and consisting mostly of WMP and SMP (73pc, or 464,000t). He also said that this is only a fraction of global exchanges in powder: less than 12pc of the total quantities of milk powders traded globally during 2016, and just under half the 950,000 metric tonnes of SMP and WMP combined traded by the EU in that year. At what point does the SMP start to expire? I thought 2 years? So going forward i cant see them getting a good price for their already aging SMP unless there is a major shortage in the world markets. They must be employing a FIFO system for the SMP surely? Could you imagine the public outcry if public funds were used to buy that intervention stock? SMP? Intervention stock? Public funds? What a nostalgic convergence of concepts. Shelf life, not a problem. Mix with vinegar, dry, sell through fictitious NZ company as organic to panama, on to kazhakstan and overland to mongolia. Relabel as organic sheep milk powder, made in China, export to Australia.